By: William H. Thiesen, Ph.D.
No one individual could claim a more unique and interesting pursuit of the fabled American Dream than Joseph Tezanos. Born in 1920, in Santander, Spain, Tezanos’s parents moved to Upstate New York, where Joseph grew up and graduated from Lackawanna High School. After graduation, he began working at Bethlehem Steel Corporation’s Lackawanna plant as a crane operator and, after the war began in late 1941, he found work at Buffalo’s Curtiss-Wright manufacturing plant as a fabricator helping assemble P-40 Warhawk fighter aircraft. His future seemed assured as a skilled factory worker on the assembly line. In the spring of 1942, however, Tezanos chose to enlist in the U.S. Coast Guard at the age of twenty-two. 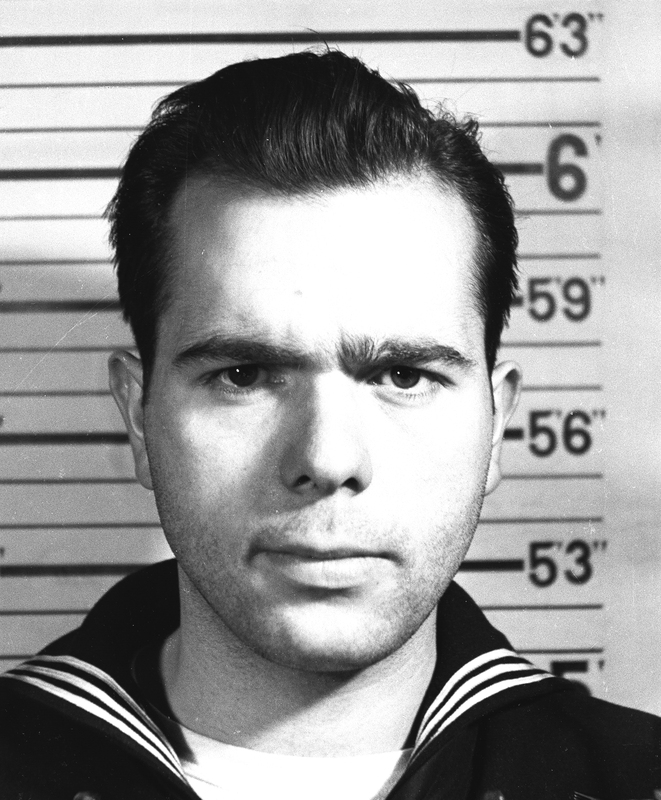 By May of 1943, after a variety of temporary assignments, he received orders to serve on board a new LST, a large ocean-going landing craft whose abbreviated letters designated it as a “landing ship, tank.” Tezanos shipped down to New Orleans and embarked on the LST 20, one of the first of many LSTs to receive an all Coast Guard crew. By July, LST 20 had transited the Panama Canal, loaded troops and war material and joined a convoy destined for the Alaskan theatre of operations and the war zone. By April of 1944, LST 20 completed its mission in the Gilberts, returned to Hawaii and moored near an armada of transports and LSTs in West Loch, Pearl Harbor, preparing for a top-secret operation named “Forager.” Forager would support the invasion of Saipan, in the Marianas island chain, which was expected to be one of the most hotly contested amphibious landings of the Pacific Theater’s island-hopping campaign. 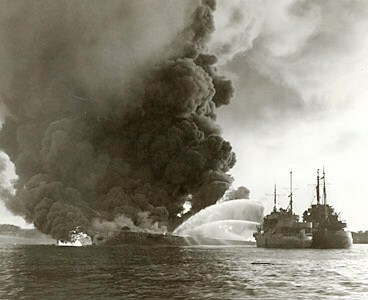 But on 21 May 1944, before the armada could set sail, an explosion on board one of the armada’s LSTs set off a chain reaction among the fleet of heavily loaded transport vessels. The ensuing cataclysm resulted in the largest accidentally caused explosion of the war in terms of lives lost, including approximately 600 wounded and dead, many of whom were vaporized at ground zero. After the shock had subsided, Tezanos scrambled on board a rescue boat along with a gang of several other hastily assembled volunteers. The small boat and its intrepid crew steamed into harm’s way despite the risk of being burned alive or blown up. Tezanos and his shipmates rescued men from the water in danger of drowning and evacuated others from the burning ships. After receiving multiple burns in the line of duty, Tezanos helped save over forty of the disaster’s survivors. By summer’s end, LST 20 began preparing for its next operation, but Tezanos received orders to undertake Coast Guard reserve officer training. In October, he found himself in New London, Connecticut, at the Coast Guard Academy to take the four-month program. By early spring 1945, he graduated and became the first known Hispanic American to complete the service’s Reserve Officer Training Program. His wartime commissioning in mid-January 1945 also qualified him as one of the very first Hispanic American officers in the United States Coast Guard. In May 1945, newly commissioned Ensign Tezanos returned to the West Coast to deploy as boat officer on board the troop transport Joseph T. Dickman (APA-13). Tezanos served the remainder of his tour on board the Joseph Dickman. Most of that time saw his ship transporting troops to the front. After the August 1945 conclusion of hostilities, the Dickman returned thousands of troops to the United States as part of the so-called “magic carpet ride” back home. In January 1946, Tezanos arrived in San Francisco on the Dickman’s last trip and witnessed the ship’s formal decommissioning. In the spring he returned to Upstate New York, having lived a lifetime’s worth of vivid and often horrific wartime experiences. Joseph Tezanos was ready to return to civilian life and decided to pursue a bachelor’s degree at Syracuse University. By the end of the 1940’s, Tezanos opened a new chapter in his life. In 1949, he completed a degree in management and accounting at Syracuse University’s school of business and allowed his reserve status to expire in February 1950. Tezanos married another Syracuse graduate and they had two children. He became an international businessman, using his education and gift for languages in South America, Africa and the Middle East. Tezanos passed away in March 1985 and his remains were interred at Arlington National Cemetery along with many other Coast Guard heroes. Born in Spain, Tezanos’s future had seemed assured in the factories of his adopted home in Upstate New York. World War II changed all that. Tezanos witnessed some of the war’s bloodiest fighting and survived arguably the worst accidental disaster in the war. He earned one of the highest awards for combat rescue in addition to his other ribbons, awards and distinctions and became one of the first Hispanic American officers in the history of the modern Coast Guard. Tezanos’s early life had proven an American success story as he bettered himself in the service, returned to his adopted country and built a successful career in the international business world. Coast Guard hero Joseph Tezanos as a new recruit in the service. 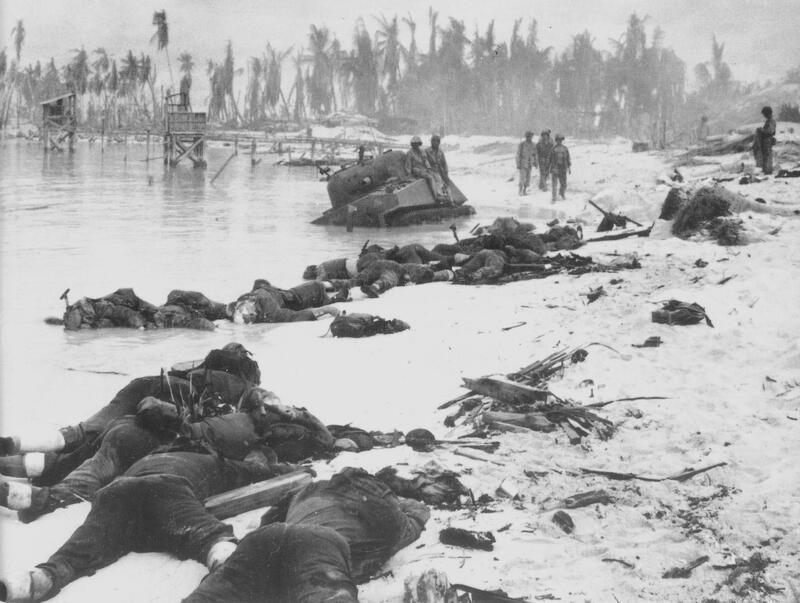 The sands of bloody Tarawa, where the Coast Guard landed marines.